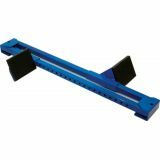 The All Weather Starting Block is designed for sure starts on cinder and all weather tracks. A spring-loaded plunger allows for fast pedal adjustment, and the secure locking pedals have rubber traction pads. Six track spikes are included. 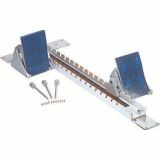 The Competition Starting Block is designed for sure starts on cinder and all weather tracks. 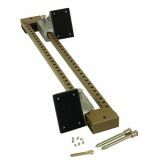 This silver powder-coat steel starting block features spring loaded plungers for pedal adjustment and secure locking. Includes 6 track spikes & spike wrench. 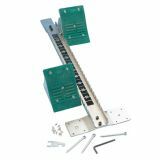 This all aluminum starting block features multiple adjustment styles. The locking pedals and pads are adjustable to four different angles and feature rubber traction pads, and chrome rail is slotted for easy pedal adjustment. 6 track spikes included. 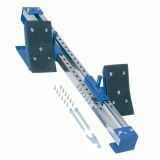 Get ahead of the pack with the Pro Style Starting Block. 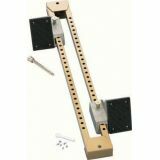 This all aluminum starting block features threaded channels that allow you to adjust the pedals to any angle which then lock in place. Six track spikes and hardware are included. Get ahead of the pack with the Champion Sports Wide Pedal Starting Block. 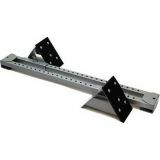 This steel construction starting block has 5" fixed wide pedals. The pedals feature a rubber pad, and adjustable heel height. Six track spikes are included.